Kristin Hannah is best known for her award-winning WWII family drama The Nightingale, a book that still lingers on my to-read pile but not for much longer. Perhaps those who enjoyed The Nightingale for its family dynamics in a high-stakes setting will also find appeal in The Great Alone. It’s hard-core, it’s emotional and it’s exciting. But most of all its core character drama packs an immense punch and I do not say that lightly. I can count on one hand the number of books that have actually wrenched tears from my eyes, and The Great Alone is the book that carries me over to my second. It sounded like an apology, but for what? For being crazy sometimes or teaching her to hunt? Or for making her eat the Hare’s beating heart? Or for the nightmares that ruined all their sleep? Leni’s dad has PTSD. But this is 1974, a time before there was even a name for it, and certainly no help. All Leni can understand is that her father came back from Vietnam a changed man: he’s angry, plagued with nightmares, and harbors a deep obsession with the government’s controlling lies. When he decides to move the family to the remote Kenai Peninsula in Alaska to live off the land and embrace nature’s wilderness, Leni’s mother is hopeful that this will be the break her husband needs to return to his former, happy self. Thirteen-year-old Leni doesn’t have a friend in the world, but her mother is her life, and she trusts her words. Even if sometimes those words are wrong. Leni is a wonderful protagonist. Bookish and strong, she’s a young girl who comes of age in the vast Alaskan wilderness: learning to hunt, fish, garden, built, make clothes and just survive in a bitte but beautiful landscape. She faces nature’s dangers throughout the story, but as she grows older she comes to understand that Alaska’s greatest dangers aren’t the predators, the risk of starvation or the freezing cold: it’s the man she loves the most in the whole world. Kristin Hannah paints an honest and emotional portrait of domestic abuse. It’s a tale as old as time, a story that has been told in so many books, but when paired with a story of survivalism it hits home just that little bit more. Leni’s dad, Ernt, isn’t just an abusive partner; he’s also a victim of a serious mental health condition. Though no reader could condone his behaviour, his backstory brings his character more depth, more believability. And I understand Cora, his wife, who can’t bring herself to leave him. I see her strengths, I see her many flaws, and I feel like she’s an accurate representation of a real-life domestic abuse victim. It’s books like The Great Alone that can help us find compassion for those in similar situations. The age-old argument is still rampant: “if they’re hitting you, why don’t you leave them?” Kristin Hannah does a good job of showing the complexities of an abusive relationship: how it’s never that simple, but also shows the consequences of complacency. Most of all, Hannah really makes a point of stressing the immense power an abuser can hold over their victim. Alone in the Alaskan wilderness, Leni and her mother are not afraid of the bears, the wolves, the thousand ways they could so easily die. What they are afraid of is Ernt. But The Great Alone is so much more than a tale of abuse. It’s a coming-of-age story with a lovable protagonist. It’s a story of family and community, with a whole host of secondary characters who are as vivid and enjoyable as the main. It’s a story of love in all its forms, each one of them as emotionally-charged as the next. 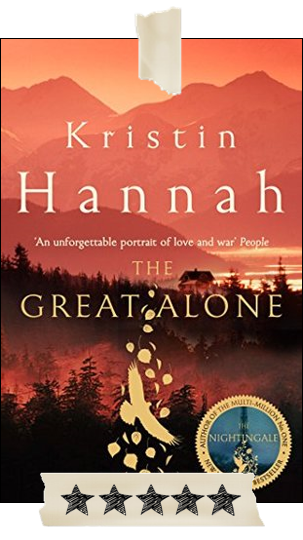 It’s a story of nature and its wonders: Kristin Hannah truly made the Alaskan wilderness feel alive on the page. I can’t remember the last time I’ve really been able to immerse myself into a fictional world; I truly felt like I was there with the characters: hunting rabbits and tending the land, preparing for the stark Alaskan winter with Leni and her family. I adore survivalist lit, and I wish there had been even more details about how the family and tiny Alaskan community fended for themselves, but what there was of it was marvelous and brilliantly engulfing. Honestly, this book stole my heart. In less than 500 pages, Kristin Hannah squeezes in so much, but she does it so well. There’s action and excitement, there’s surviving and thriving, there’s amazing characters, growing pains, gut-wrenching love, dread and woe, happiness and contemplation. And then there’s just me, crying in my bed over fictional characters, wishing the story hadn’t ended. Another great review. I wonder if you will be reviewing the new book by will.i.am and David Johnson – Wizards & Robots, if so I shall read your opinion with interest.